French Pastry Chef François Payard, owner of Payard, François Payard Bakery, Inc. and FC Chocolate Bar in New York, and Payard Las Vegas at Caesars Palace shares his very French recipes for Chocolate Macarons and Charlie's Chocolate Pudding Cake, as part of the fourth annual New York Culinary Experience hosted by New York magazine and The International Culinary Center. 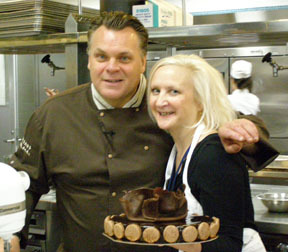 Long a fan of French pastry Chef François Payard, I knew that I was definitely in for a treat, no pun intended, when I enrolled in his class, "Francois' Favorite Chocolate Desserts," during the New York Culinary Experience at The International Culinary Center in New York. When I saw the class title, I knew it was where I belonged, as I am a self-proclaimed, dedicated, and passionate chocolate dessert lover. My mother Victoria V. Argen, taught me to bake at a very young age. Standing on a chair, as I could not even see over the countertop, I learned to bake beside her. She instilled the love of baking with me, and we both love creating beautiful desserts to share with family and friends. On April 28, 2012, I realized a dream when I took Chef François Payard's class, as he is a true master of French pastry, a third-generation pastry chef, who learned the art and the love of baking from his father and grandfather. Born in Nice, France he learned the art of French pastry at his grandfather's shop on the Riviera, Au Nid des Friandises. After studying and working in Paris, he came to the United States in 1990, worked at the restaurant Le Bernadin in New York, and 1993, went to work for Daniel Boulud, who later became his partner when he opened Payard. 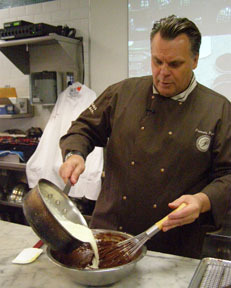 In addition to also owning New York City based François Payard Bakery, Inc., and FC Chocolate Bar, he owns Payard Las Vegas at Caesars Palace, and is a published cookbook author. A chef on the continual rise, a few of his many achievements include the James Beard Foundation's "Pastry Chef of the Year" 1995, "Pastry Chef of the Year" 1998 by Bon Appétit Food & Entertainment, The French Government's prestigious Ordre du Mérite Agricole, Medal of Honor 2004, and Wine Spectator's Award of Excellence in 2005. In 2006, he became a member of Relais Desserts International, a professional association of the 85 Best Pastry Chefs in the World, and in 2010 received the Dom Pérignon Award of Excellence, which recognizes outstanding leadership, character, and work ethic in the hospitality industry. Speaking with Chef François Payard on the subject of television cooking shows, his charming French-accented English as thick and sweet as ganache, he said that he would like to see more television shows like Julia Childs had made, that teach technique, rather than today's competition shows, as there are many people that would like to learn how to do something. He told the class, "I will demonstrate how to make and decorate the cake, and how to make the macarons, but I will not only show you what I can do, I will show you what you can do when you leave the class." 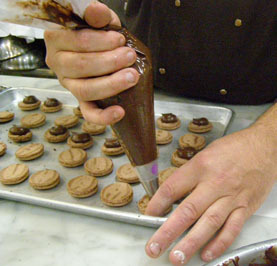 This is the essence of a good teacher, as learning to bake and decorate to pastry-shop standards requires not only being able to follow a recipe; one must also master various often difficult techniques. Dedicated, passionate about the art of baking, he also loves teaching as evidenced by his quick smile and laugh, twinkling blue eyes, and the care that he gave to each of the students in the class, who learned to decorate cakes to pastry-shop quality, and create the most famous of French sweets, the macaron. Chef François Payard graciously shares his recipes for Chocolate Macarons and Charlie's Chocolate Pudding Cake. Bon Appetit! 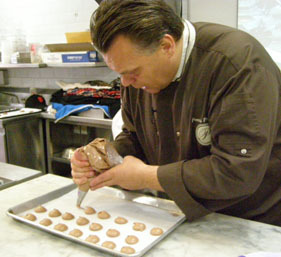 Chef François Payard writes, "The macaron is the most Parisian of all cookies, found most famously at the shops Ladurée, Fauchon, or Pierre Hermé. There cannot be a chocolate book by a French pastry chef without a recipe for chocolate macarons! Plus, they are addictive; a rich ganache is sandwiched between two meringues that have a crunchy exterior shell, and a chewy, moist interior. You can fill them with pistachio purée or seedless raspberry jam if you want, but my favorite will always be this chocolate classic. Unlike most macaron recipes, other than Ladurée's, these are made with a cooked meringue. Anything with meringue is sensitive to humidity; make them on dry days preferably." Sift together the confectioner's sugar, almond flour, and cocoa powder over a large bowl. Stir in 4 egg whites, blending until the mixture is smooth and lump-free. With a candy thermometer handy, combine the sugar and ½-cup (125 grams) water in a medium saucepan over medium-high heat. If sugar sticks to the sides of the pot, dip a pastry brush in water and brush the sides. While the sugar is cooking, put the remaining five egg whites in the bowl of an electric mixer fitted with the whisk attachment. Once the sugar reaches 221° F (105° C) on the candy thermometer, start beating the eggs on high speed. When the sugar reaches 250° F (121° C), pour in into the eggs in a slow stream, with the mixer running, down the inside of the bowl. 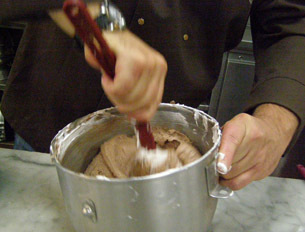 Continue beating until the meringue is thick and the bottom of the bowl is cool to the touch. With a silicone spatula, gently fold the meringue into the dry ingredients, in four increments. Fold until everything is well combined. Spoon the batter in a pastry bag or resealable plastic bag, and cut a ½-inch opening in the tip or corner of the bag. 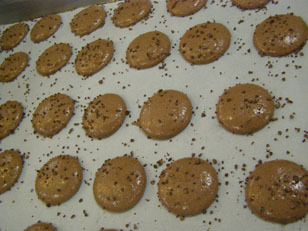 Pipe the better into quarter-size circles onto the prepared baking sheet, leaving about 1-inch between each macaron. The macarons should have a uniform size. Gently tap the baking sheet on your work surface to eliminate any tips on the macarons. Let them sit out at room temperature for 15 minutes, until a skin forms. This will transform into a beautiful crust on the finished macarons. Put the macarons in the oven, and turn the oven off for 5 minutes. After that time, turn it back on to 400° F (204° C), and continue baking for 8 minutes, until a crust forms and they are soft inside. Remove from the oven, and let the macarons cool in the pans. Method: Combine both chocolates and the corn syrup in a medium bowl. Assembly: Turn the silicone baking mat over, and carefully pull it away from the macarons, to free them up. Turn half of the macarons over, so that their flat side is facing up. 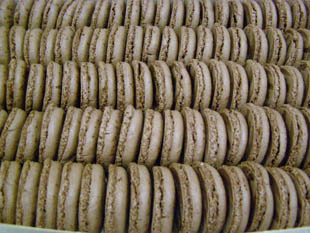 Store the macarons in an airtight container in the refrigerator for up to 1 week, or in the freezer for up to 2 months. Serve the macarons at room temperature. 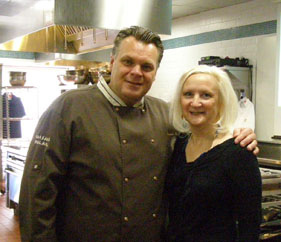 Chef Payard writes, "My brother, Charlie, a pastry chef and instructor, also looks after an older woman's house. His Afternoon Cake serves to impress her children, but this one is definitely to impress her, with its rich, almost molten-like texture. Because it is baked in a water bath, this cake remains soft in the center, like a pudding. It is then glazed in chocolate, which gives it a very shiny, elegant finish. You can make this cake a day ahead and keep it in the refrigerator, but only glaze it shortly before serving so that the glaze retains its shine. It is best served at room temperature." Method: Place a rack in the center of the oven and preheat the oven to 400° F (204° C). Brush the sides and bottom of a round 9-inch cake pan with butter. Dust it with flour, shaking off the excess, and set it aside. 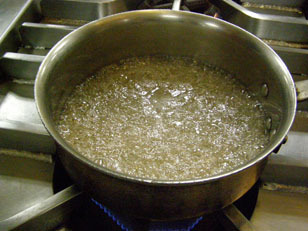 Put the butter in a medium saucepan over medium-high heat and bring to a boil. Remove from the heat and add the chocolate to the pan. Whisk until the chocolate is melted and the mixture is smooth. In a large bowl, whisk the flour, sugar, and eggs together until just combined. Stir in the chocolate mixture, then the cream. Pour the mixture in the prepared pan. Place the pan on a larger sheet pan with a lip. Bake the cake for 18 minutes, then add water to the sheet pan, and place a piece of aluminum foil and a baking sheet over the top of the cake, to keep it from rising too much and to keep it moist. Lower the oven to 360° F (182° C) and bake for another 20 minutes. The cake will be just set around the edges, and very loose in the middle, like a pudding. Remove from the oven and let the cake cool to room temperature while still in the pan. Place it in the freezer for at least 45 minutes or refrigerate overnight. Method: Combine the chocolate and corn syrup into a small bowl. Pour the cream in a small saucepan over medium-high heat and bring to a boil. Pour it over the chocolate. Whisk the chocolate mixture until smooth. Let the glaze stand at room temperature for 5 minutes, then whisk in the butter. Finishing the cake: Line a baking sheet with parchment paper, and place a wire cooling rack on top of the paper. Remove the cake from the freezer, and dip the bottom of the pan in hot water to unmold it. You want the pan to be just warm enough for the cake to come out smoothly, but not melt. Flip the pan out onto the rack and tap the pan until the cake pops out. 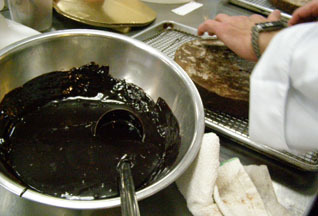 Pour the glaze over the cake, using a spatula to even out the top and help the glaze run down the sides of the cake. Carefully, with a serving spatula, lift the cake from the rack, and place it on a serving platter. 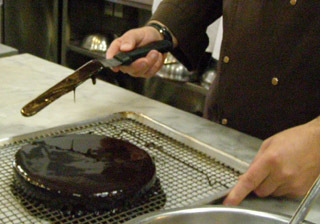 Allow the cake to come to room temperature for 30 minutes, which will give the glaze time to set up. Using the back of a spoon, lightly tap the top of the cake all over, to create small peaks in the glaze. You can also run your spoon over the top of the cake in a large figure eight swirl, going from one end of the cake to the other. Serve at room temperature. Read about Chef François Payard's class in the Gastronomy section. Read about other classes in the Gastronomy section and interviews and recipes from the other classes in the Chefs' Recipes section.